Consumer goods companies often outsource copacking services to outside contract packagers, adding a costly and time-consuming step between manufacturing and the distribution center. Those companies can streamline their supply chains by integrating contract packaging services into existing distribution operations. Doing so can reduce combined distribution, packaging and transportation costs by 30%, and can cut at least 7 days in order-to-delivery cycle time. Read more in our Viewpoint paper: Integrate Packaging with Distribution Operations. 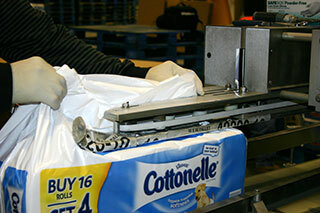 Here are five very compelling reasons to integrate product packaging into DC operations. Typically, products ship out to the contract packager and then back to the DC for final distribution. These extra runs hike freights costs an estimated 38%. Eliminating these costs on an $8 million spend would mean a savings of $3 million, not to mention the added environmental benefit of taking trucks off the road. Use of an outside copacker adds about 7 days to the distribution cycle. Worse, companies typically lose visibility of their product during this time, creating uncertainty about the amount of product available for sale. Manufacturers deal with this uncertainty by adding inventory, which in turn adds warehousing, labor and financing costs. Combined packaging/distribution operations allow for labor and rolling stock to be deployed where it’s most needed at any given time, across multiple functions. Cross-trained workers can be available to address peak demands in the DC or the copacking area. Management costs are also reduced and the functions can share security, clerical, maintenance and other facility staff. The more product is moved, the greater the potential for damage. Shipping product to and from an outside packager results in about 3% damage. If it’s a liquid product, the percentage will be higher, since damage to one bottle can destroy multiple cases. Some third party logistics providers that have developed their businesses to manage copacking operations very well. But beware of false advertising. Moving a complex contract packaging operation to a distribution center is a big shift, from a “ship it” to a “make it” operating environment. Make sure your 3PL partner has made the important changes required, like having experienced packaging engineers on staff and having a rigorous quality control process to manage the greater risk inherent in a packaging environment. Let’s be clear. Contract packaging companies are generally very good at what they do. The need for a new model is not driven by a flawed packaging capability; it’s driven by a flawed, unnecessarily complex supply chain process. It’s only a matter of time before manufacturers of all sizes recognize integrated packaging and distribution as an opportunity to get products to market faster with greater flexibility and at a lower cost.